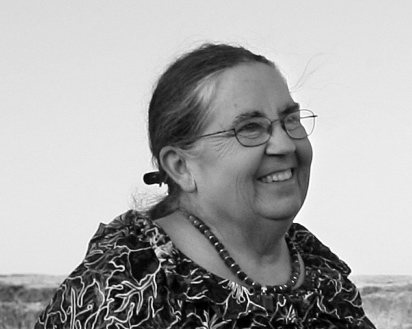 Our friend and partner Dixie Thomas Reale succumbed to cancer September 1, 2013. One of a kind is an overused description, but in Dixie’s case, it was true. She had a great sense of humor, a fierce will, and loved to tell stories. Here is one of our favorites, published in Voices from the Snake River Plain. It was war, and I would wait until it grew mold. I didn’t care. I’d show her! When Mama said we couldn’t leave the breakfast table till we finished our mush, my sister Jose and I made vomiting sounds. Mama had sugared and creamed our oatmeal to make it tempting, said it was “Goldilocks’ porridge,” but we weren’t convinced. “You’ll eat. That’s final,” she warned. Mama had read an article about the health value of oats and decided her children would eat some every morning. I wanted Cheerios like my cousin Alice ate in her daffodil-colored breakfast nook with the plaid on the wall. The more Mama pushed the gruel, the more determined I was that I wasn’t going to eat it. I would have Cheerios instead. Daddy looked out the window, studying the rose bush on the far side of the yard, resolved to not hear us. We sat on our bench along the wall, gagging and giggling while our parents ate. “You’ll stay there till you’ve eaten it, bowl and all,” Jose mimicked. She whispered that she’d show Mama, but I could tell right off she didn’t have the guts. She gave up and ate her mush a few minutes after the family left the table. I guess she realized she was gonna be stuck there for a long time. Not me, I had my mind made up. Maybe Mama could make me sit, but she couldn’t make me eat. The rest of the family went about their morning while I fidgeted. Nine thirty, ten o’clock, still I waited. Mama wasn’t going to give in and neither was I. It was a beautiful spring morning. I wanted to go outside, run through the grass, roll down the hill, climb around in the hayloft, and rub the fur on Calico’s back till she purred. Although Mama didn’t intend to be, she was helpful. When she took a stack of dirty dishes to the kitchen, I grabbed my chance. I sneaked across the room and dumped the cereal out the window. It dribbled down the spiked leaves of the irises planted below and puddled on the ground around the lilies of the valley and violets. I hoped nobody would notice. When she returned to the dining room my bowl was empty. I was beaming. “Such a good girl! See, it’s not so bad,” Mama said. I ran off to play. The next day I dumped the mush on the irises once again and congratulated myself on my clever solution. By day three I couldn’t ignore the blobs of dried oatmeal clinging to the purple flowers and the puddled mud and sour milk underneath. Mama spent a lot of time in her flower garden, she was sure to see. I’d better not dump it there again. So I called Pedro, my puppy. He came to me through the flowers, wagging his whole back end, he was so eager. I leaned out the window and held the cereal down for him to reach. He gobbled all the mush. Back inside, I set the empty bowl on the table. I could go on like that forever, no one suspected a thing. It was too easy. I was cocky. The family had barely finished breakfast the next morning when I whistled for the dog, leaned out the window, and held the dish down to my little buddy stretching up on his hind legs when—whop! Right on my behind. I was jerked back inside, sitting at attention, the mush in front of me. Somehow Mama had grabbed it before any spilled. I was miserable. I’d observed that when my sister dropped a crust of bread on the floor she didn’t have to eat it. When Daddy spilled the serving bowl of corn Mama scooped it up and wiped the tabletop with the dishrag. I tried it. Only one little spoonful dripped out of the bowl. I gagged down the rest for the sake of the experiment. It worked. I didn’t have to eat the dribbled stuff. The next day I got bolder. I carefully placed two large globs right beside my fork. Again I didn’t have to eat the slopped part. That was the answer. I decorated the room. The entire bowl was drizzled and splattered one spoonful at a time across the mahogany tabletop, the wall, the bench, and onto the floor. There was so much of it that gray puddles ran into one another making small lakes. Once Mama saw the mess she scraped it back into the dish and slung it in front of me. Now it was cold and slimy, had a faint flavor of English wood oil, and smelled a bit like floor polish. “You will eat this,” she said. I sat there wretched and alone, sequestered with my punishment, till the rest of the family came in for lunch. And still I lingered with my gruel while they ate sandwiches and soup. The day after my spilled mush episode I woke to an empty house. The family had gone to the berry patch to pick blackcaps. The cursed bowl waited malevolent and disgusting. I lolled on my seat playing with a strand of hair, studying the ceiling, my head hanging backwards over the edge of the bench. How could I get rid of this stuff without eating it? I was tracing lines on the bottom of the dining room table with my finger, pretending that I could write, when suddenly there it was. I got on my knees to examine it. A little shelf designed to store extra leaves was built into the bottom of the table, and it was empty. I patted it to be sure. The bowl fit that shelf like the two were made for each other. I was out of the house in seconds. The dog episode had taught me one thing—patience. I made sure I waited a while after the family left the breakfast table to hide my mush. When Mama asked what I’d done with my dish, I lied sweetly. “What a big girl,” she said. It never occurred to me that Mama would eventually run out of cereal bowls. In my child’s mind she had an endless supply, but one day she asked Jose if she had broken any while washing dishes. I didn’t care that my sister might get the blame for something I had done. She was four years older and liked to boss me around. Besides she caved in over eating the mush. It would serve her right. I didn’t volunteer any information and was too young for Mama to suspect I’d know anything. My plan worked wonderfully until one morning Mama was cleaning house, trying to track down a sour odor in the dining room. There they sat, lined up like guilty children waiting to be spanked, on my little shelf. Ten rancid helpings of fuzzy, rotten mush. I truly believe if it hadn’t been moldy, Mama would have made me eat every bite, she was that mad. But the next morning at breakfast a brand new box of Cheerios sat in the middle of the dining room table and mush was never mentioned again. Question of the month: How can I write when I’m so dreadfully stressed? Join the parade! This is what I’m doing. As long as I’m halfway up the wall I’m going to grab a foothold, brace myself, peek over and take notes. I might get some unique insights that would otherwise be lost in the fog of forgetting. Let me tell you about stress. A few weeks ago I was diagnosed with stage four cancer. At first my brain was in a muddle of confusion, I was scared and didn’t know what to do. Then it came to me. This is one of the GRAND ADVENTURES of my lifetime — I will probably not be back this way again in this existence anyway. A quick ride in the ambulance from my house to St. Benedict’s. Then a life flight from Jerome to St. Luke’s in Boise. I’d never been in a helicopter. The trip was exciting in a strange way. My mind kept drifting toward the source of life. The closer I approached the nugget of consciousness as we know it the more vivid my insights grew. I saw infinity in all directions — matter, time, space, motion, wind, electricity, sound and entire worlds. I saw creation across the face of the deep when God stretched forth a hand and flung stars into the big bang and said, “Let there be light.” I realized I am stardust drifting forever in the cosmos, both infinitely conscious and unconscious. I am everywhere and nowhere all at one time. One evening a thunderstorm rolled through Boise. I was on the ninth floor and I got an unusual display just outside my window. Since it was Independence Day, I thought it was pyre-techniques. Then it occurred to me what it was — I’d heard of but never seen ball lightening — absolutely beautiful in an awe inspiring way. It looked like twin fire tornadoes turned sideways. I looked first through one then the other when they lumbered past my window. Brilliant burning vortices — maws opened to the black depths of creation. I saw birds and other animals both large and small, eating and being eaten in turn. Everyone eats. I glimpsed where I am ultimately going, and guess what — I’m already there. Although I’m not in any big rush to get back to the little spot where my life slipped through to this side when I was born, I know all I will have to do when the time comes is slide back down that life thread and figure out how to get back through the pin hole-divider to where I need to be. We are part of infinity. And infinity by definition is forever. There are no beginnings or endings in eternity. Infinity goes on and on forever in all directions, in all times, and all ways. That is what I saw when I grabbed a handhold, braced myself against the wall and wrote notes. It doesn’t take much effort and the results are absolutely amazing. Who knows what you might see over your fence. So next time you are making excuses about not writing because you are too stressed, think of the possibilities. You will be amazed at what you will see if you take the time to peek and write notes. I say that a lot and not just at Christmas. My writing buddies are Bonnie Dodge and Dixie Thomas Reale, who are also my partners in Other Bunch Press. Here is why they are important and why you need writing buddies. They support and encourage me, especially on those days when I want to throw my computer out the window. They are great critique partners. While I am good at plotting, they are good at motivation, characterization and making me dig deeper, which only helps my writing. They understand the writing life and how it is to work on a project for months without the guarantee of a paycheck. They are great at brainstorming ideas and ticking your imagination. They love and respect the written word. They are tough when they need to be, but also complimentary. 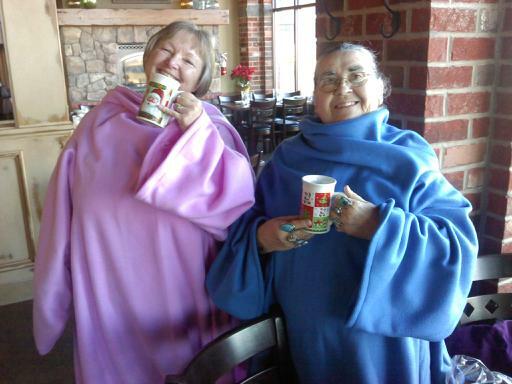 I have known many other writing buddies, but these two women are also my friends. I have said this many times before, writing is a sometimes painfully solitary endeavor. But it helps to have people with who you can talk writing, and that helps ease the pain at making words appear on a blank sheet of paper or computer screen. I urge all of you to find writing buddies in the new year if you don’t have any, and for those of you that do, please express your appreciation for them. The phrase “show me don’t tell me” has confounded beginning writers for years. What does it mean? Remember in English Composition 101 the professor admonished the class to avoid loaded words at all costs. Then in Creative Writing 101 the instruction was “show don’t tell”. I think it is impossible to do both so I ignore those warnings. Avoiding loaded words is a good idea when writing “how to” instructions but otherwise the writer needs to be aware of and use loaded words to his/her advantage. As you recall loaded words like “mother” and “love” carry emotional connotations. When writing fiction, poetry or creative non fiction, emotionally loaded words are desired, even necessary. As an author you need to be free to pick among the variations and nuances of meaning that words carry. Imagine — you are writing a story. The main character is alone in the house when the doorbell rings. You need to get her to the door. If you say Mary went to the door it gets her there. However, if Mary stormed to the door, we understand more. If Mary wandered aimlessly to the door, we understand something else. And if Mary strutted to the door it presents another vision of Mary. We don’t have to tell the reader that Mary is mad, preoccupied, stoned or proud — we show it. I always keep my thesaurus close by when I write so I can sort through the infinite variation of connotations and nuances of meaning of words that basically do the same thing in widely different manners. Dixie, Pat and I had a productive weekend. Before our reading at The Cabin, we stopped by Rediscovered Bookshop and A Novel Adventure, independent book stores in Boise, Idaho. We hope you will support these bookstores whenever you are in Boise. 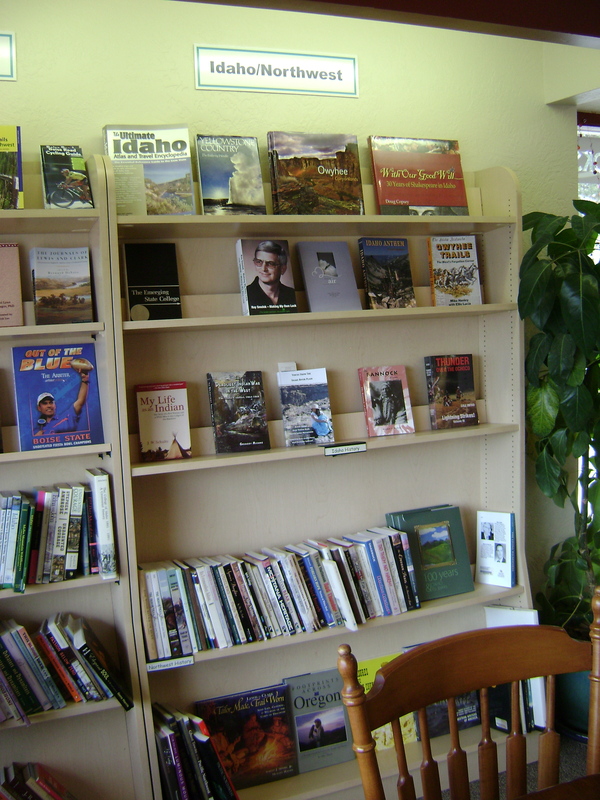 You can find Voices from the Snake River Plain in the Idaho/Northwest section at Rediscovered Bookshop.